And her dad decided that for every year of her life, he would give her a ring. 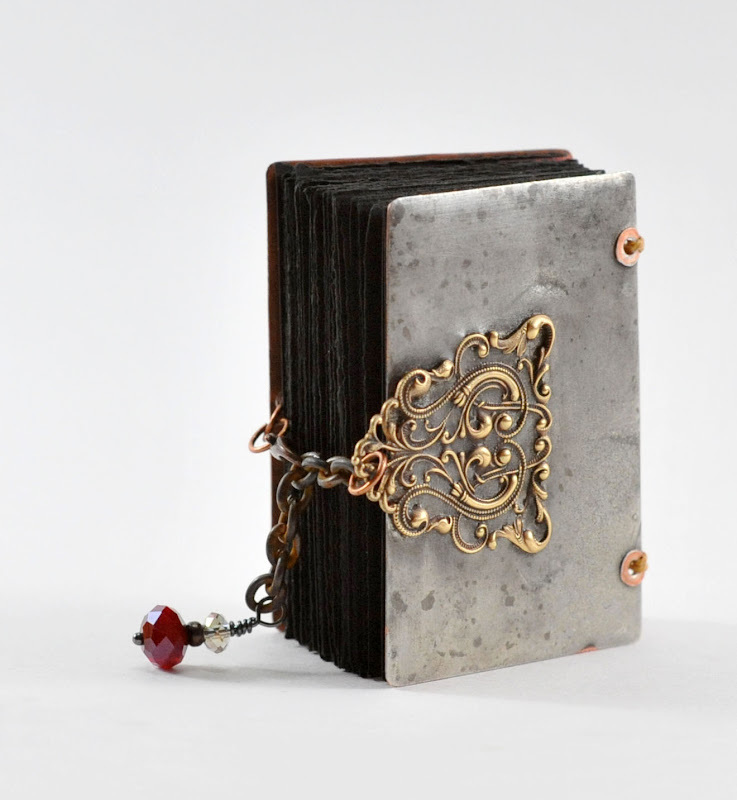 I recently completed a couple of new metal books. But, this time they're for class samples. 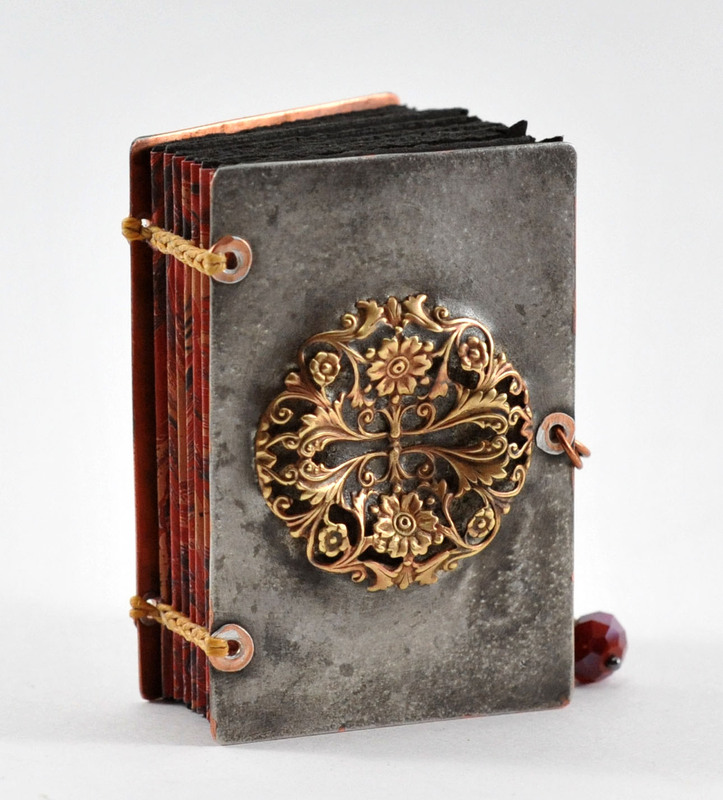 I'm teaching two classes at Gilding the Lily in Fullerton, California, next month. 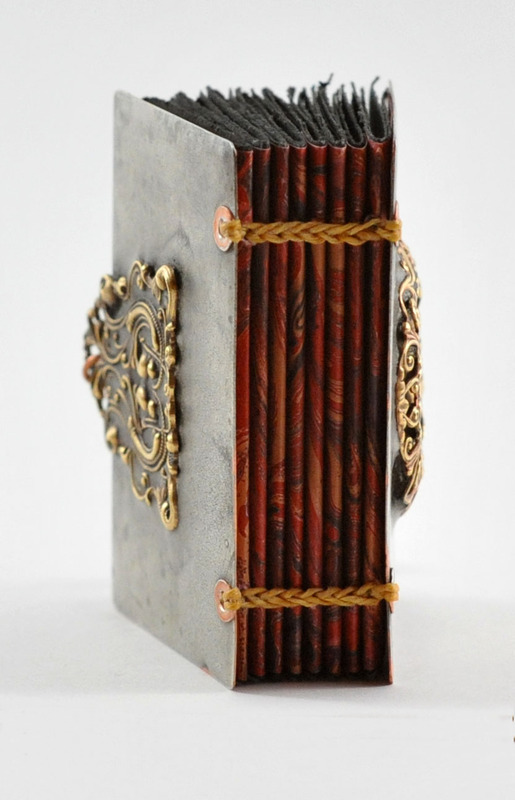 I'll be teaching this small Coptic-bound book class on Saturday, April 2. 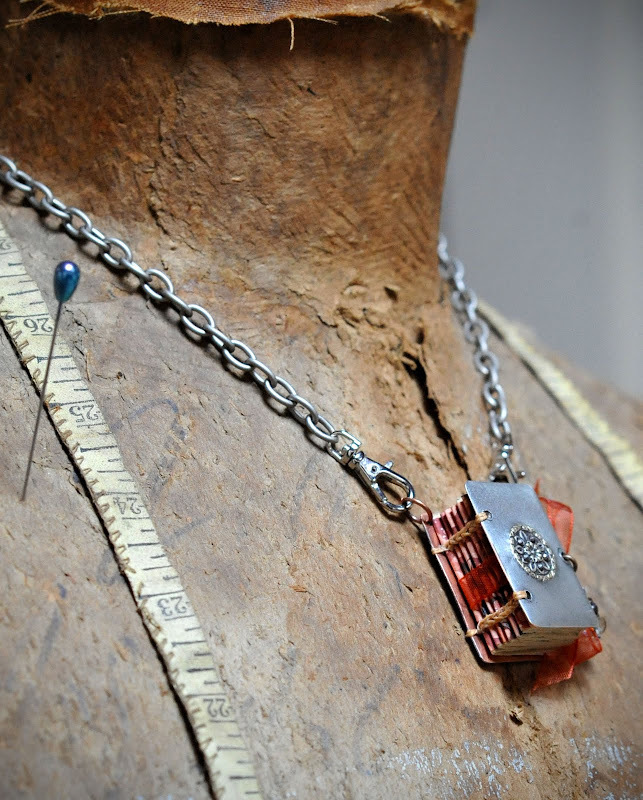 And this even smaller book necklace on Sunday, April, 3. One of the family heirlooms I treasure most is this little half of a Union Case that holds a photograph of my grandmother as a child. In the photo, she is wearing a set of beads, which I also have and cherish. However, I know that my grandmother's image couldn't have been the original photograph in the case for two reasons. The obvious reason is that I can see another picture peeking from behind, but also because my grandmother was born in 1908. She was too modern to have had her image captured as either a daguerreotype or an ambrotype -- the two types of images most commonly protected by a Union case and made between 1840 and 1865. So, who is under my grandmother's image? This morning, I carefully pried the image out of the case and pulled the foil away from the glass sandwich. 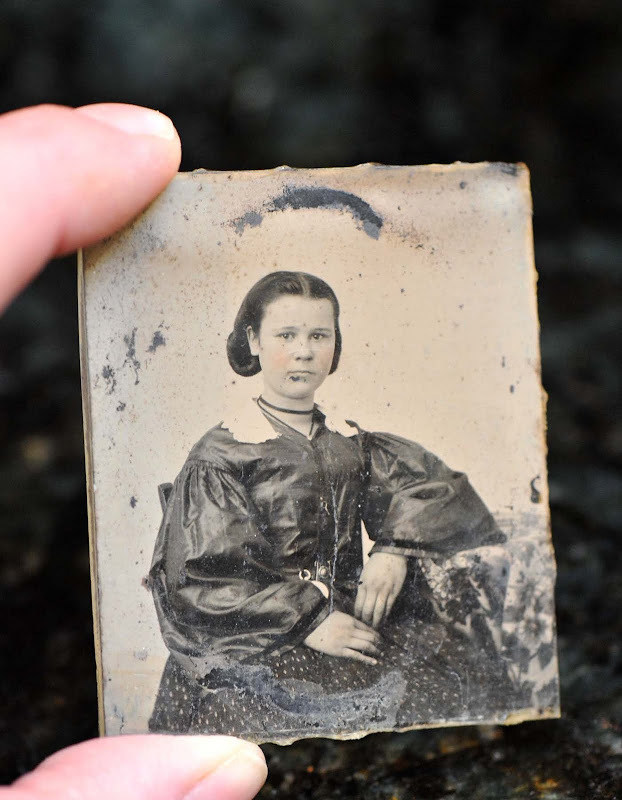 Behind the first piece of glass and my grandmother's image, I found an ambrotype. I love the way an ambrotype looks so ghostly before a dark surface is placed behind it. In this case, simply holding the glass image over my dark countertop brings the woman/girl into focus . . . even her soft pink (tinted) cheeks! But, who was she? Am I related to her? I may never know. There was another image tucked into the bottom of the case. 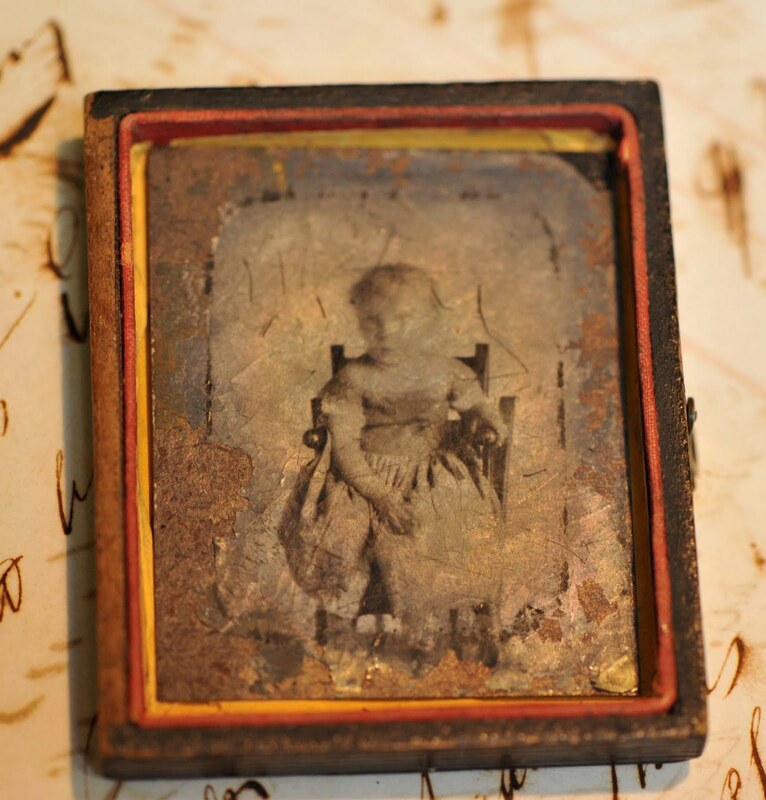 Who was the child in this now-eroded daguerreotype? Again, I may never know. After taking several photos of each image, I wrapped them up carefully and tucked them back into the half case -- made even more precious by their presence. 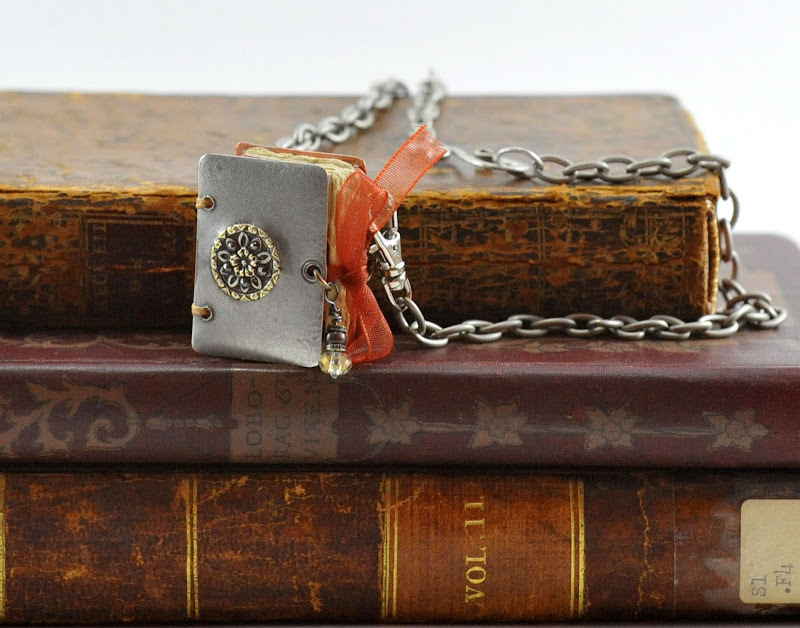 Daguerreotypes (1840-1855) are on polished silver so they are very reflective, like a mirror. 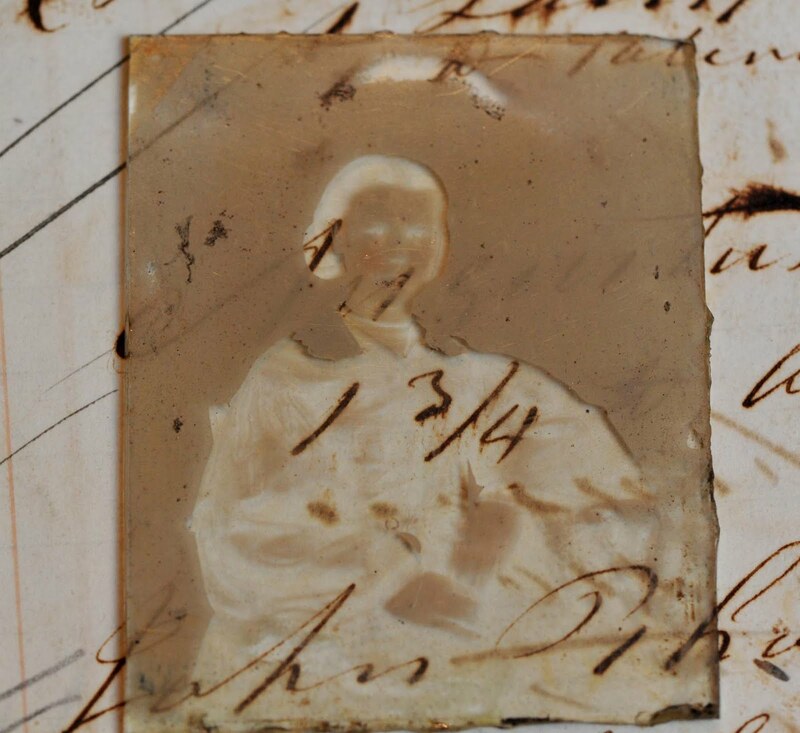 Since they are on silver and subject to tarnish, daguerreotypes were put behind glass and sealed with paper tape so air cannot tarnish the plate (there often is some tarnish around the edges of the picture). 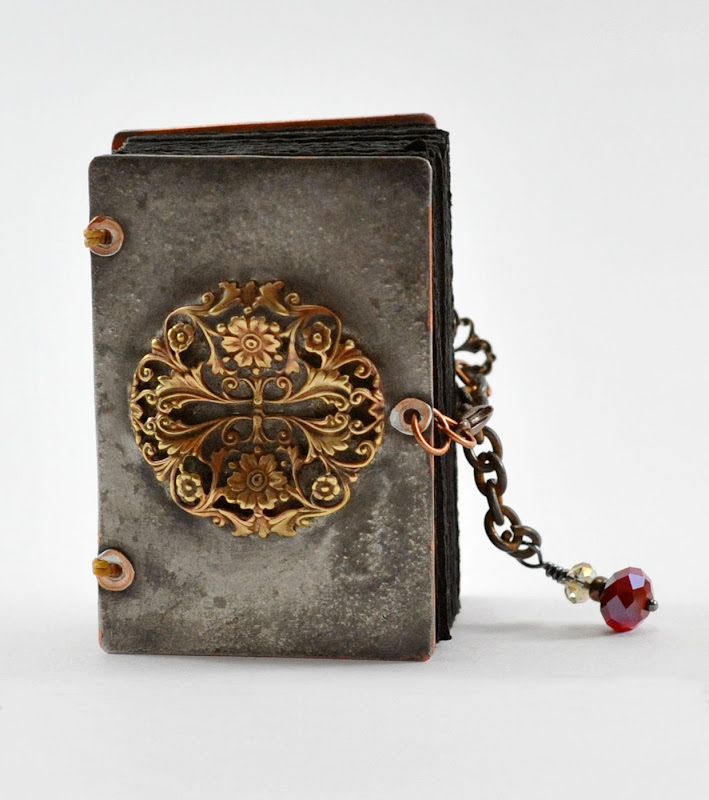 This was then put into a small hinged case, similar to a woman's compact. But, the easiest way to tell if you have a daguerreotype is to see if it has that reflection, just like a mirror. You have to tilt it back and forth to see the image. 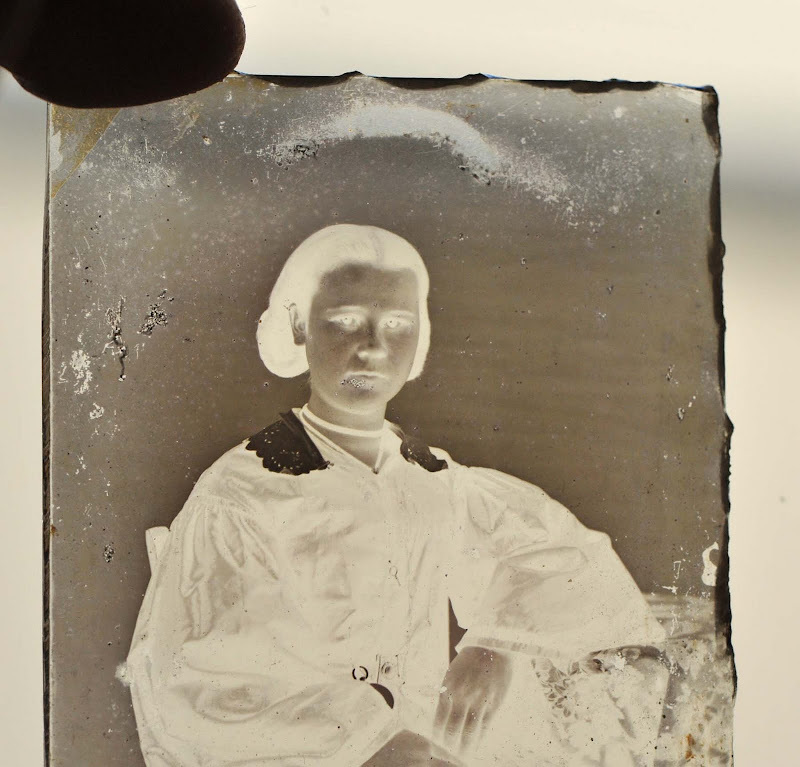 The second type of photograph, ambrotypes, (1855-1865) also came in hinged cases but in these there is a photographic emulsion that has been coated onto glass so they do not have that "shiny mirror" reflection (but, being on glass they are somewhat reflective). If you take an ambrotype out of a case and hold it up to the light you can usually see through the picture (since it's on glass). Ambrotypes don't tarnish but the black paint painted on the backside of the glass often dries out, cracks, and then peels off. The second biggest problem is the emulsion turns dark making the image look dark. This problem is similar in appearance to when a daguerreotype's silver plate is tarnishing but that (the tarnish) has a bluish tint to it. Tintypes (1855 through the turn of the century) are made using the same photographic emulsion as the ambrotypes but, rather than coated onto glass, the emulsion has been coated onto black-painted tin and then exposed. Since they are not on silver they do not have the reflection and, since they were not fragile, are not usually found in cases. 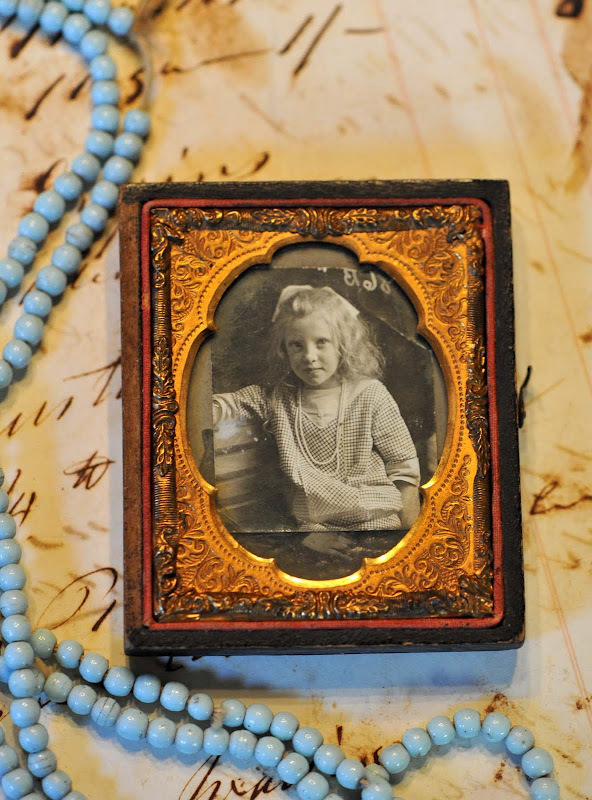 Early tintypes are sometimes found in cases as that was still the convention at the time but most often they're loose or have been placed in photo albums along with later paper photographs. These are usually about the size of a business card and, in fact, the paper photos that size are called CDVs for the French term Carte de Visite, or "calling card" as people would give them to their friends when the visited. Sometimes they dropped them in a basket in the parlor and the friend would then collect them in an album.